The list below is not exhaustive; a complete bibliography of just the texts consulted during this project would require many pages. 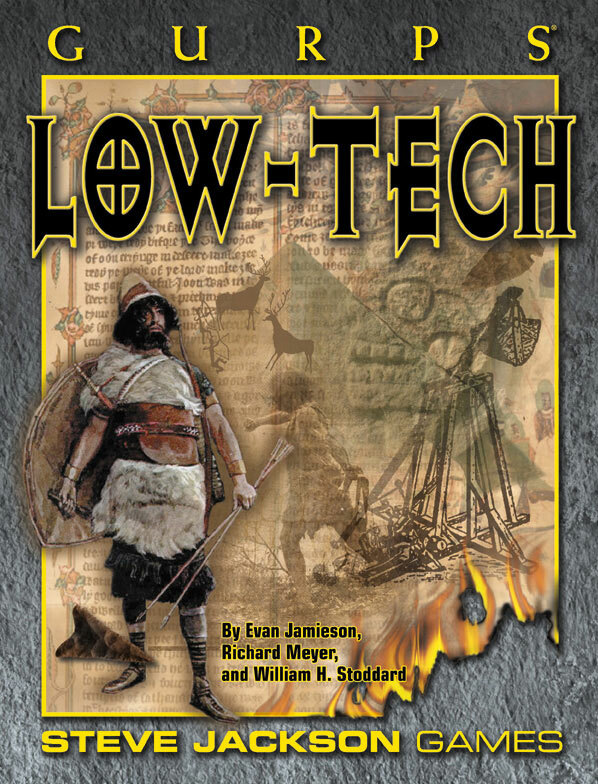 These texts discuss technologies in a fashion useful to the historical gamer, as well as a handful of books on subjects that are less commonly discussed in print at all. Encyclopedia Britannica. A good encyclopedia can provide further information on many of the topics discussed in GURPS Low-Tech. The Britannica is the most comprehensive and the most scholarly. Its articles also provide a tremendous amount of the sort of information that makes good sidebars for GURPS books. No one reference book is infallible, but there's no better place to start. Adkins, Lesley and Roy, Handbook to Life in Ancient Rome, Oxford University Press, 1994, and Handbook to Life in Ancient Greece, Oxford University Press, 1998. Ready reference books that provide a solid level of detail about the culture, weapons, armor, and other equipment of ancient Greece and Rome. Balent, Matthew, Weapons and Castles and Weapons and Armor, Palladium Books, 1982. Exhaustive surveys of weapons and armor used worldwide, with generic game statistics. Barber, Elizabeth Wayland, Women's Work: The First 20,000 Years, Norton, 1994. A survey of fiber and clothing from Paleolithic string skirts to Egyptian court robes. Burenhalt, Goren, General Editor, American Museum of Natural History, Illustrated History of Mankind, Harper SF, 1994. Five-volume set of handsomely illustrated surveys of ancient cultures, including The First Humans: Human Origins and History to 10,000 B.C. (Vol. 1), People of the Stone Age (Vol. 2), Old World Civilizations (Vol. 3), New World and Pacific Civilizations (Vol. 4), and Traditional Peoples Today (Vol. 5). Cantor, Norman, Ed., The Encyclopedia of the Middle Ages, Viking Penguin, 1999. The 600 individual entries include many that focus on particular items of technological interest, although the primary focus is on key persons, places, and events of the period. Casson, Lionel, The Ancient Mariners – Seafarers and Sea Fighters of the Mediterranean in Ancient Times, 2nd Ed., Princeton University Press, 1991. Still the most comprehensive history of the evolution of sailing vessels and naval warfare, from earliest recorded history to the 15th century. Casson, Lionel, Ships and Seamanship in the Ancient World, Johns Hopkins, 1995. A recently updated history of ancient Mediterranean seafaring. Coles, John, Archaeology by Experiment, Scribners, 1973. How to do serious reality testing of archaeological theories; full of actual, tested numerical results about prehistoric and ancient technologies. Requires critical reading, though, as some experiments do not perfectly replicate the original technologies. Connolly, Peter, Greece and Rome at War, Greenhill Books, London, 1998. A comprehensive look at the weapons, armor, strategies, and tactics used by ancient Greece and Rome. Contains a large amount of physical detail (lengths, weights) on various arms and armor, as well as subsections on naval warfare and siegecraft. Cotterell, Brian, and Kamminga, Johan, Mechanics of Pre-industrial Technology, Cambridge University Press, 1990. In effect, this is freshman physics, with all the examples taken from anthropology and archaeology. Daniels, Peter T., and Bright, William, Eds., The World's Writing Systems. A very detailed scholarly handbook on writing throughout history and throughout the world. The quality of the graphic reproduction is superb; this book shows what the text really looked like. David, A. Rosalie, Handbook to Life in Ancient Egypt, Oxford University Press, 1999. The latest entry in this ready reference series surveys all aspects of daily life in one of the original cradles of civilization. de Camp, L. Sprague, The Ancient Engineers, Ballantine Books (reprinted 1998). An entertaining summary of the great engineering feats of the human race up until the Renaissance. Individual chapters detail Egyptian, Greek, Roman, Arab, and Chinese contributions. Deng, Gang, Maritime Sector, Institutions, and Sea Power of Premodern China, Greenwood Press, 1999. Information on a number of Chinese ships less familiar than the junk, and on the economic impact of their construction and operation. Diamond, Jared, Guns, Germs and Steel, W.W. Norton & Co, 1997. A highly readable study of how and why some cultures advanced more than others in various technologies, and what the historical consequences were. Diehl, Daniel, and Donnelly, Mark P., Siege – Castles at War, Taylor Publishing Co., 1999. Based on a Discovery Channel documentary, this volume employs over 150 photos of re-enactors to illustrate the aspects of a late medieval siege. Drews, Robert, The End of the Bronze Age, Princeton University Press, 1993. Excellent description of armies during the age of chariot warfare, and the factors that led to the passing of that age, set within a larger discussion of why the major Bronze Age civilizations almost simultaneously faltered around 1200 B.C. Engels, Donald W., Alexander the Great and the Logistics of the Macedonian Army, University of California Press, 1978. A case study of one historical period illuminates problems of supply and mobility that shaped many earlier and later wars. Farb, Peter, Man's Rise to Civilization: The Cultural Ascent of the Indians of North America, 2nd Ed., Dutton, 1978. A classic anthropological work, still worth reading as an overview of Stone Age societies and cultures, but a little hard to find. Favier, Jean, Gold and Spices: The Rise of Commerce in the Middle Ages, 1998. Excellent source outlining the developments that influenced merchants, trade, banking, etc., during medieval times. Ffoulkes, Charles, The Armourer and His Craft From the XIth to the XVIth Century, Dover Publications, Inc., reprinted 1988. This book, originally published in 1912, provides a comprehensive description of the European armorer's trade: the tools he used, the types of goods he made, and the manner in which they were produced. Fliegel, Stephen N., Arms and Armor: The Cleveland Museum of Art, Harry N. Abrams, Inc., 1998. Solid discussion of the history and development of medieval weaponry, with many illustrations drawn from the museum's collection. Gamble, Clive, Timewalkers: The Prehistory of Global Colonization, Harvard University Press, 1994. A survey of human colonization throughout the world and its effects on the environment. Useful for questions of subsistence and survival. George, James L., History of Warships: From Ancient Times to the Twenty-First Century, Naval Institute Press, 1998. Most of this book is post-TL3, but the discussion of early warships is well researched and lucid and includes excellent treatments of naval tactics. Gernet, Jacques, A History of Chinese Civilization, 2nd Ed., translated by J. R. Fisher and Charles Hartman, Cambridge University Press, 1982. Seminal French work on Chinese history from the Shang dynasty to the Mongol invasions. Devotes serious attention to documenting the course of technological developments. Gies, Frances and Joseph, Cathedral, Forge, and Waterwheel, Harper Perennial, 1994, and Daily Life in Medieval Times, Black Dog and Leventhal Publishers, 1999. The former book focuses on medieval developments in technology and documents the influences of non-European (Chinese, Indian, Islam) sources of change. The latter book is a new illustrated compilation of three popular previous works by the same authors – Life in a Medieval City (1970), Life in a Medieval Castle (1974), and Life in a Medieval Village (1991). Gimpel, Jean, The Medieval Machine: The Industrial Revolution of the Middle Ages, Penguin Books, 1976. This book on medieval inventions and innovations provides some of the best data available about the effects of various technologies on production yields. Grant, Michael, The Ancient Mediterranean, Dutton/Plume, 1988. This history devotes some attention to Mediterranean civilizations that often command less attention, like the Phoenicians and Carthaginians. Greenhill, Basil, The Evolution of the Wooden Ship, Batsford, 1988. Detailed plans for the construction of a number of historical ships. Hawkes, Jacquetta, The Atlas of Early Man, St. Martin's Press, 1976. Compares the course of cultural, technological, and artistic development in every region of the world from 10,000 B.C. to 1000 A.D., focusing on eight periods ranging in length from 500 to 2,000 years. Hardy, Robert, Longbow: A Social and Military History, A detailed examination of the longbow by one of the weapon's foremost authorities, including the author's notes on the bows recovered from the Mary Rose. Includes a chapter on making your own, from choosing the wood to breaking-in. Heer, Friedrich, The Medieval World: Europe 1100-1350, 1962. Focuses on non-military developments in business and the sciences. Hooper, Nicholas, and Bennett, Matthew, The Cambridge Illustrated Atlas: Warfare – The Middle Ages 768-1487. Though the primary focus of this volume is a review of the strategies of medieval warfare, the appendices provide a very useful summary of technological trends in arms, armor, army composition, and siegecraft. Hourani, George F., Arab Seafaring, Princeton University Press, 1995. A seminal work on naval innovation, focusing solely on the vessels, technologies, and trade routes used by the Arabs. Hope, Lt. Col. C.E.G., Encyclopedia of the Horse, Viking Press, 1973; and Hyland, Ann, The Horse in the Middle Ages, Sutton Publishing, Ltd., 1999. Two sources that discuss the invention and spread of riding equipment, a subject provoking intense debate due to the lack of period sources. See also Hyland's The Horse in the Ancient World. Irwin, Geoffrey, The Prehistoric Exploration and Colonization of the Pacific, Cambridge University Press, 1992. An analysis of seafaring by the Polynesians and their predecessors, based on anthropology, practical sailing experience, and computer models. James, Peter, and Thorpe, Nick, Ancient Inventions, Ballantine Books, 1994. Discussion of ancient technological developments, with particular focus on the bizarre. Keegan, John, A History of Warfare, Knopf Books, 1993. A noted military historian dissects the history of warfare to identify the seminal events that changed the nature of battle forever. Kern, Paul Bentley, Ancient Siege Warfare, Indiana University Press, 1999. A recent study of siege warfare from Mesopotamia to Rome. Excellent use of ancient sources. Landels, J.G., Engineering in the Ancient World, University of California Press, 1978. A survey of major technological achievements of the Greeks and Romans (link is to the revised edition of 2000). Levathes, Louise E., When China Ruled the Seas, Simon & Schuster, 1994. An account of Zheng He's voyages of 1405-1433 and of Chinese seafaring in general. MacQueen, J.G., The Hittites – And Their Contemporaries in Asia Minor, Thames and Hudson, 1975 (revised 1986). This general history contains some intriguing details on Hittite military equipment and chariot units, which were very unlike those of other lands. Manley, John, The Atlas of Past Worlds – A Comparative Chronology of Human History 2000 B.C.-A.D. 1500, Cassell Publishers Ltd., 1993. This book uses archaeological evidence to compare cultures and civilizations in five areas of the world at each of four years in history. Marsden, E.W., Greek and Roman Artillery: Historical Development, Clarendon, 1969. This comprehensive review of all the documentary evidence on Greek and Roman heavy weapons is a classic. McClellan, James E., III, and Dorn, Harold, Science and Technology in World History, Johns Hopkins, 1999. 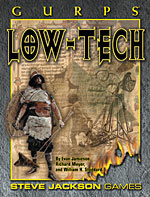 A comprehensive survey of the development of technology, with especially good coverage of prehistory and non-Western cultures. The perfect one-volume overview. McEvedy, Colin, The New Penguin Atlas of Ancient History, Penguin Books, 2003. This text, recently reprinted, provides insights into the growth of populations, trade routes, etc., during the Classical Age. McGrail, Sean, Ancient Boats in N.W. Europe, Longman, 1987. Despite the title, this book is actually a survey of boatbuilding traditions throughout the world, as revealed by anthropology and archaeology. Many tables provide rich quantitative information on watercraft. Messadie, Gerald, Great Inventions Through History, W. and R. Chambers, Ltd., 1991. An attempt to pinpoint dates of historical introduction of many important innovations from the Stone Age to the 1900s. Needham, Joseph (and others), Science and Civilisation in China, Cambridge University Press, 1956-1998. This monumental, definitive multi-volume study is also available in an abridged form, The Shorter Science and Civilisation in China. Oakeshott, R. Ewart, The Archaeology of Weapons: Arms and Armour From Prehistory to the Age of Chivalry, Dover Publications, Inc., 1996. Republication of a 1962 work that chronicles the development and use of weapons over 30 centuries, based on both archaeological finds and evidence from contemporary art and literature. Sawyer, Mei-Chun (Ed. ), and Ralph D. (translator), The Seven Military Classics of Ancient China: Wu Ching Chi Su (History and Warfare), Westview Press, 1993. Translations of Sun Tzu's Art of War and six other ancient works that dispense guidance on how to build armies, plan battles, and wage war. Sherratt, Andrew, Economy and Society in Prehistoric Europe, Princeton University Press, 1997. A collection of innovative essays on widely diverse aspects of European prehistory, from the distribution of trade goods to Scythian pot parties. Equally worthwhile as serious scholarship and as entertaining reading. Smil, Vaclav, Energy in World History, Westview Press, 1994. A survey of the worldwide evolution of technology, with statistical information on many topics. Unger, Richard W., The Ship in the Medieval Economy: 600-1600. Describes major ship types of the Byzantine, Viking, and medieval European traditions. Warry, John, Warfare in the Classical World, University of Oklahoma Press, 1995. Superbly illustrated volume that traces the evolution of warfare from 1600 B.C. to 800 A.D. Filled with many sidebars detailing the attire and weapons of representative men at arms, ship types, and siege engine designs. Webster, Graham, The Roman Imperial Army, A & C Black, 1985. Less concerned with strategy and tactics than with logistics and administration, this volume describes the unglamorous details behind Rome's defense of its empire. Welsh, Frank, Building the Trireme, Constable, 1988. Describes the reconstruction of an ancient Greek warship in a modern boatyard; entertainingly written and a good guide to the intellectual controversies that surround this aspect of naval history. Yadin, Yigael, The Art of Warfare in Biblical Lands in the Light of Archaeological Study, McGraw-Hill, 1963 (2 volumes). Beautifully illustrated with images of ancient art and artifacts. This survey of the development of warfare in Israel and neighboring lands is especially valuable for its discussion of the technological limits on military action and the competing evolution of weapons and defenses.